Today we are going to learn how to write a paragraph on Diaspora. It is written especially for Class 11 or HSC level. 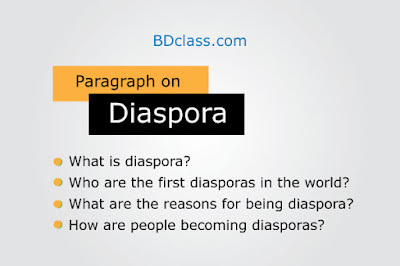 The Diaspora paragraph is written with easy words, you can use it for Class 8 and SSC. We also published diaspora paragraph with Bangla meaning in our Bengali version site. To read it offline, you can download the paragraph about diaspora in PDF format. Who are the first diasporas in the world? What are the reasons for being diaspora? How are people becoming diasporas? Diaspora means the people who had left their original homelands and settled in other countries of the world. Either they were forced to leave the country and they willingly left. First, Jews ancestor Abraham was forced to leave Iraq. So he took shelter in Egypt. After that, his offspring Jews were compelled to leave Egypt and they took shelter in Palestine. The Jews were the first diaspora in the history of mankind. Later in the Islamic era, many of them were again forced to leave Palestine. Then these Jews became diaspora in Europe and America. After World War II, the Jews started coming back to Palestine with the help of western power and they also formed a new land called Israel. Now the Palestine are being forced to leave their homeland. As a result, they are also being diaspora in many countries of the world. We all see the latest incident. Myanmar government has compelled the Muslim minority "Rohingya" to flee from their home. Actually, the process started after 1970. An estimated 3.5 million Rohingya dispersed in many countries worldwide before August 2017. Most of the Rohingyas about 9,50,000 people took shelter in Bangladesh. Some of them fleed to India, Indonesia, Malaysia, and Thailand. However, nowadays people are being the diaspora willingly because of Globalization.